I was out the door by 5:30am and headed down into the Hayden Valley. What a day it was to be. As I approached Otter Creek, I saw a brown lump on the shore of the Yellowstone. 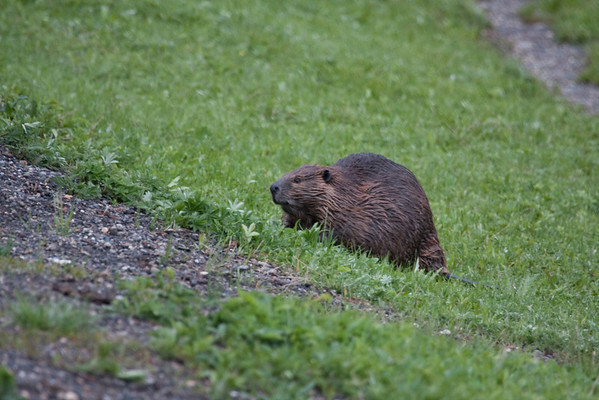 Last year my wife and I saw a muskrat, so I thought it might be the same one. Low and behold, it was a beaver. It proceeded to pose for me for about 30 minutes before it got into the water. I was using my 100-400L lens because I was fairly close. The grass he was eating was fairly tall, so I didn’t get many shots with the full beaver, tail and all. I was surprised by the number of vehicles that passed me, only two stopped to check it out. I proceeded on south into the Hayden. The Hayden bison herd was in the Alum Creek area, with a few red dogs, but I figured I would late till later when there was better light. It was a very cloudy day and it drizzled on and off all day. I pulled up to Grizzly overlook and was intrigued by the amount of elk that I saw on the east side of the valley near the tree line. I had never really seen that many elk at once in the Hayden. I began looking with my binoculars and was watching a gentleman with a professional camcorder, chatting with some girls and loaning them my binoculars when I heard a crash to the north of me. About 200yds north of the look out two grizzlies were fighting. Of course I didn’t have my camera(s) on me because that was something I was not expecting. I flew to the truck and grabbed my 100-400L and started to shoot when I realized that they were coming in my direction. I turned back to the truck to grab my bear spray just in case, and told an older couple they should watch out, as they decided they should walk towards the bears. Fortunately, I did not need the spray, but with the overcast conditions and the time of day, I needed some help with the lens. I cannot handhold that lens at 400mm, even with the image stabilization. 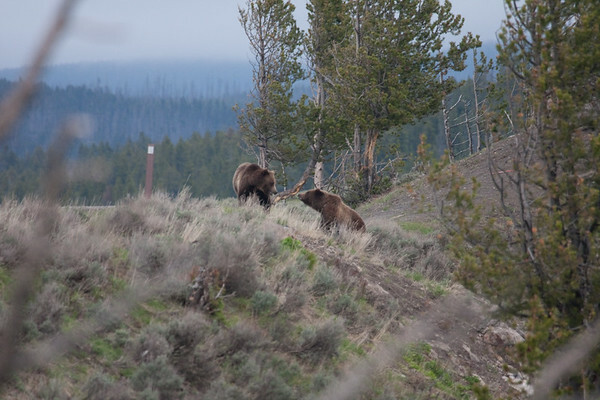 The fight ended quickly and the loser continued toward and to the west of Grizzly Overlook. The victor started heading back to the river, originally I had thought maybe one of them was a female with a cub, but I don’t think that was the case. As the fight was concluding, I noticed that the herd of elk across the river from the overlook was running. There were two gray wolves chasing them. What a dilemma on what to watch. I returned to the truck and decided to get the big gun out. I set up the Gitzo and Wimberly and got out the 600mm. The bear proceeded to swim the river and then began chasing the wolves. What a sight. I then added the 1.4x on because I still needed the reach. I then proceeded south through the Hayden, on to Lake Lodge, back to Fishing Bridge, out to Lake Butte Overlook, and back to Fishing Bridge. No real luck in seeing any of the bigger animals. I love having breakfast at the General Store, and that is what I did. I then headed out to the east entrance of the park to Pahaska Teepee Resort to check on the foxes. They are still there and I had a brief glimpse of one of the adults during my two hours there. I will have to come back. I spoke with some folks who had just returned from a trail ride at the resort and they saw a mother grizzly with a cub in the meadow above the resort. I then decided to head back toward Canyon and maybe a nap. I got sidetracked right at the beginning of the Hayden watching a pair of coyotes hunt. Then went on to Grizzly overlook, but did not see much of anything. The ranger at Grizzly overlook heard on the radio about a bear jam between Cascade Lakes Trail and Dunraven Pass, so I thought I would check it out. I only caught a quick glimpse before they disappeared into the forest. 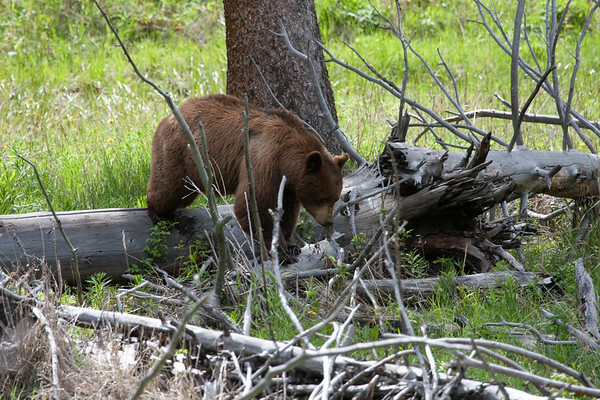 It was a cinnamon black bear with a cub. On over Dunraven, but I didn’t really see anything all the way to Tower Junction. I had also heard some bears were around the Petrified Tree so I decided to take a look. It was a full on bear jam because of the narrowness of the road, but the rangers were being fairly good about letting visitors watch. It was a cinnamon male and a black female black bears courting. They then headed over the mountain south of the petrified tree. I decided that it was time to try to find the Badger Sett, but no luck and I wasn’t sure where to look. I headed back to the Canyon area for some dinner, and on the way back down Dunraven encountered the cinnamon female again, but I did not see the cub. After dinner, I headed to Grizzly overlook to sit out the rain storm. I began watching some elk again and two cows swam the river to retrieve their calves. I started watching closely because they seemed really nervous. The rain stopped and a herd of elk on the other side of the river to the north of Grizzly came into view and then they took off running. It was a black wolf chasing them. He singled out a cow and started chasing her south. She jumped into the river and began swimming, he followed. They ran uphill and to the south of Grizzly out of view. I loaded up and began to follow. What a runner. He was well ahead of where I thought he would be, so I continued to move forward. He missed his meal but continued south toward another elk herd. The light began to fail, so I began packing up when I was told of a “black” bear coming north along the Yellowstone toward the wolf with the elk between. I spent some time watching at Elk Antler Creek, but didn’t see the bear or the wolf again, however, there was at least one, if not two beaver swimming in the river and the creek. I finished packing up for the night and headed up the hill to the south, and was just in time to see a black phased grizzly chasing the herd of elk. It was 9:00pm, so it was time to head to the lodge, and begin getting ready for tomorrow.